Not only should Liverpool fans be grateful to Dirk Kuyt for his 286 appearances and 71 goals, but we should also thank the loveable Dutchman for his role in signing Luis Suarez back in 2011! Liverpool poached the Uruguayan from Ajax for £22.7m in January that year (via BBC Sport), but at the time, Reds were more worried about Fernando Torres’s sale to Chelsea and more interested by Andy Carroll’s arrival! Suarez went on to enjoy three and a half brilliant years with the club, coming within inches of Premier League glory in 2013/14 after a mesmerising 31 goal haul which earned him a monster move to Barcelona – for whom he’s continued to break records. But if it wasn’t for Kuyt, Suarez may never have signed for Liverpool in the first place. Not only did the versatile attacker convince us of his qualities, but he also spoke up Liverpool to the South American. 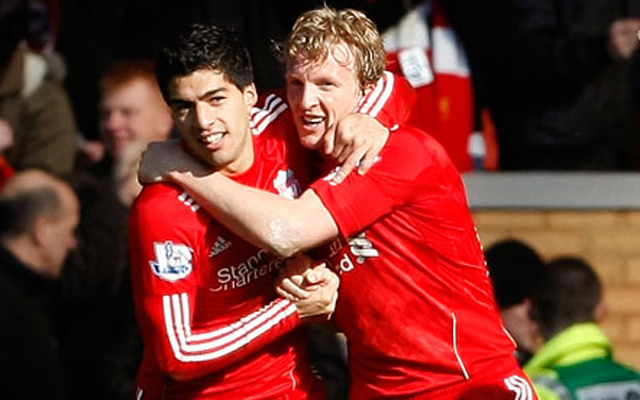 Kuyt told Four Four Two magazine: “Prior to Luis’ arrival at Liverpool, I was aware of the club’s interest. “They had asked my opinion of him as a player, and of course I was very positive. “Just after I heard that Luis about to sign, I called him to congratulate him and tell him that if he or his family needed anything – advice on housing – he could call. “From the start there was a mutual click – with our families, too. “Our bond was reflected on the pitch. In his first six months we played together upfront, and we became a really good pairiing.